Richard O'Brien (born Richard Smith; 25 March 1942) is a British-New Zealand actor, television presenter, musician, writer, voice artist and theatre performer. After a long and successful career based in the United Kingdom, he gained dual citizenship with New Zealand in 2011, where he resided in Tauranga. O'Brien wrote the musical stage show The Rocky Horror Show, which has remained in almost continuous production. He also co-wrote the screenplay of the film adaptation, The Rocky Horror Picture Show released in 1975, appearing in the film as Riff Raff. O'Brien also appeared in the hugely popular ITV series Robin of Sherwood in 1986, as Gulnar, alongside Jason Connery. He presented the television show The Crystal Maze for Channel 4 from 1990 to 1993 and is the voice of Lawrence Fletcher, the title characters' father in Phineas and Ferb. 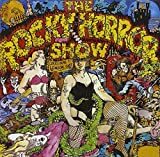 The Rocky Horror Picture Show: Sing It!